This month marks the twentieth anniversary of the Srebrenica massacre, in which 8000 people were killed in the Bosnian town of Srebrenica. The mass killing was the single deadliest event of the Bosnian War, and the most recognized atrocity of the post–Cold War era. A number of reports about the anniversary have mentioned my research and books about the conflict, including this item by Srdja Trifkovic (“Srebrenica, twenty years later“) and another by David N. Gibbs (“The Srebrenica Precedent“). The 20th Anniversary edition of my book, Operation Deliberate Force is available now as an ebook from Amazon’s Kindle store. Operation Deliberate Force was the first authoritative account of the military events of 1995 that draws on the accounts of the key participants. 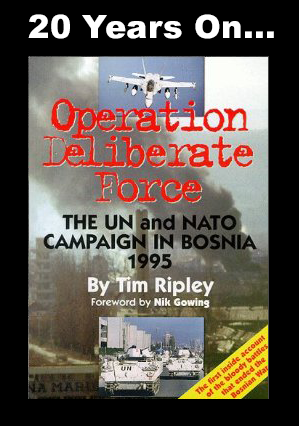 Exclusive interviews with Lieutenant General Rupert Smith, the British commander of UN forces inside Bosnia; Lieutenant General Bernard Janvier, the French commander of UN forces in former Yugoslavia and Lieutenant General Mike Ryan, the USAF commander of the NATO air campaign tell the inside story of the military moves that brought the war in three year long Bosnian war to an end. They describe their roller-coaster year, from the disasters of the spring and summer of 1995 through to launching of Operation Deliberate Force in August and September.